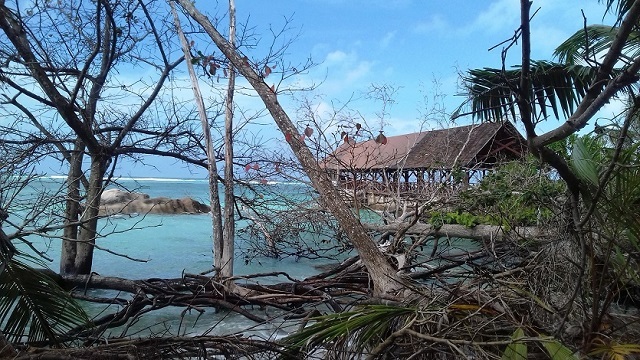 Coastal erosion on Seychelles' second-most populated island is forcing a hotel to taking precautionary measures. Strong waves crashing at Anse La Farine, in the south end of Praslin, are affecting the beach close to the hotel. “We think it has something to do with global warming and a rise in sea level,” Brulinger said. Amelie says that erosion along the coasts on Praslin is not only due to the sea level rise but also the development being done in coastal areas. 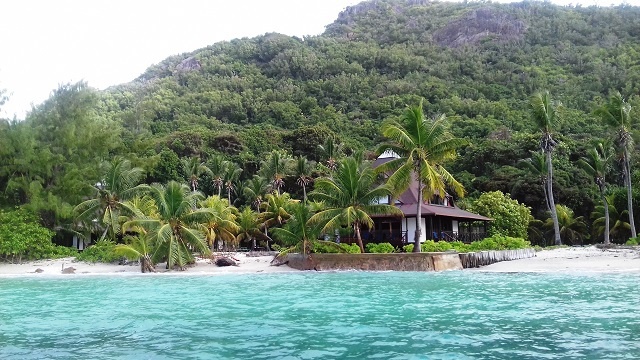 Accessible to the most tenacious hiker or by a 15-minute boat ride, Anse la Farine’s proximity to the ‘New Emerald Cove’ has made the 42-room destination popular for visitors seeking peace and quiet in Seychelles, an archipelago in the western Indian Ocean. The waves, after splashing metres away from several beach loungers, recede, dragging coconut trees and other things in their paths. The once-beautiful beach is now littered with stumps of fallen trees. Brulinger says these changes have been happening for several years but have escalated recently. A native of the island and a seasoned fisherman, Herbert Athanase, has the same concern. “In the old days, the sand will come and go with the seasons, but this has not happened in recent years,” says Athanase, who has worked for several years with the company. Built over 20 years ago, the New Emerald Cove had a facelift in 2000 after a change in management, from an Italian to a Seychellois-based company. In 2015, Seychelles experienced one of its highest tides at 2.7 metres and several infrastructures along the coast were affected. Another one is predicted for November this year, and Amelie says it will be between 2 to 2.6 metres. “An extreme high tide has the most impact when it is accompanied by strong wind which makes the waves higher and stronger which should not be the case in November,” says Amelie. 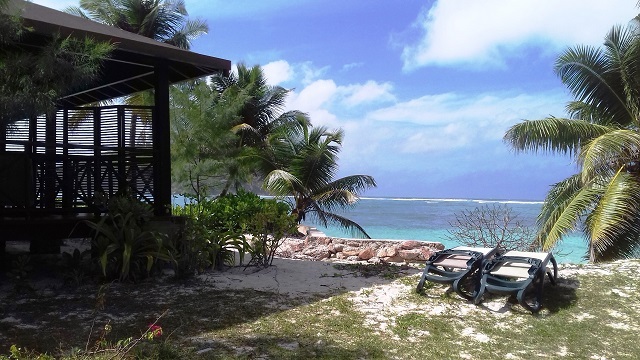 Normally in the Seychelles islands, the wind blows from slight to moderate in November. The 70 staff of the New Emerald Cove Hotel is, nevertheless, preparing for the worst. 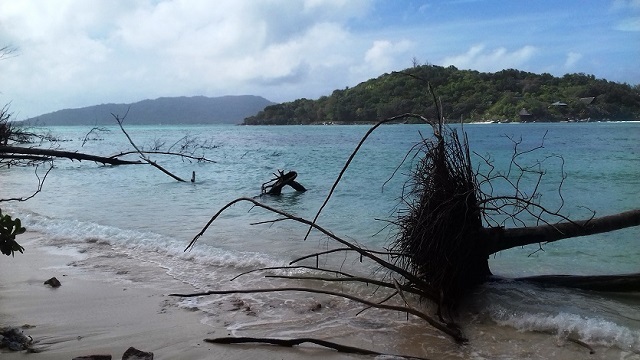 Other areas on Praslin have also experienced the effects of rising sea level in recent years. 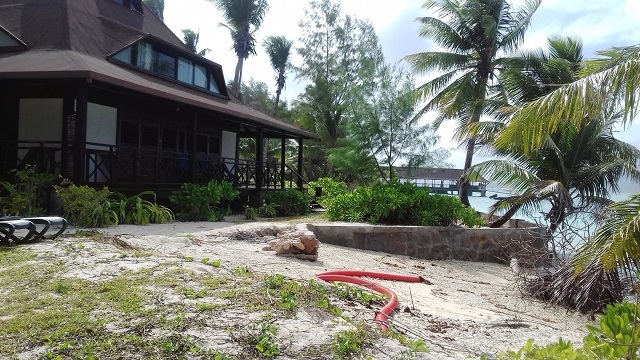 Another example is a one-kilometre stretch of coastline, in the north-western part of the Seychelles' second most populated island of Praslin, more precisely at Anse Kerlan, where the community have even sought international help to mitigate the impact of this natural occurrence. Less than 400 metres above sea level, Praslin might face more environment issues due to rise in sea level in the coming years. Data from the UN’s Intergovernmental Panel on Climate Change predicts that sea level will rise by 50 to 100 cm by the year 2100.